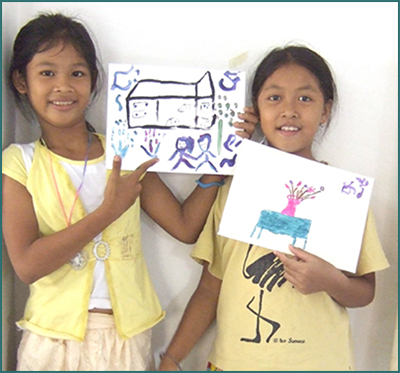 Art classes were conducted for children affected by AIDS in the Doen Penh slum community. Many of the children are the primary income earners for families ravaged by AIDS. They work shinning shoes, scavenging garbage or selling newspapers and often cannot go to school. Art in a Box brought art and school supplies to families affected by AIDS living in Phnom Penh’s squatter communities and in villages in Takmao. Although families affected by AIDS are among the poorest of the poor, art brings joy to the children and their parents. Ninety children from the slum communities of Phnom Penh enjoyed a day in the countryside on an Art in a Box field trip. Each child received a sketchbook and pencils so they could continue to practice their artwork and an Art in Society Art Award Certificate in recognition of their talents. It was a happy day! 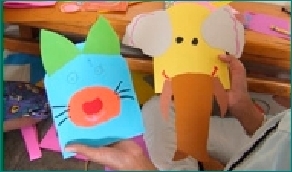 Bedside art making brought comfort to very sick children with AIDS at New Hope for Cambodian Children’s (NHCC) Transitional Group Home in Takmao, Cambodia where children stabilize on antiretroviral medication. Art in a Box delivered art supplies and conducted art class for orphaned children who have AIDS at the Mercy Center Hospice for Mothers and Children with AIDS in the Klong Toey slum in Bangkok, Thailand.